If a chimpanzee ventures into the territory of a different group, it will almost certainly be killed. But a New Yorker can fly to Los Angeles--or Borneo--with very little fear. Psychologists have done little to explain this: for years, they have held that our biology puts a hard upper limit--about 150 people--on the size of our social groups. But human societies are in fact vastly larger. How do we manage--by and large--to get along with each other? In this paradigm-shattering book, biologist Mark W. Moffett draws on findings in psychology, sociology and anthropology to explain the social adaptations that bind societies. He explores how the tension between identity and anonymity defines how societies develop, function, and fail. 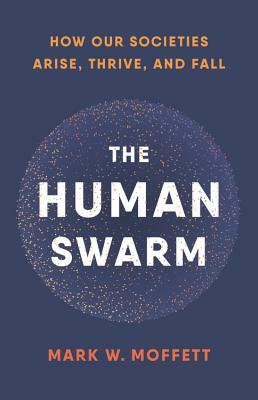 Surpassing Guns, Germs, and Steel and Sapiens, The Human Swarm reveals how mankind created sprawling civilizations of unrivaled complexity--and what it will take to sustain them. Mark W. Moffett is a biologist and research associate at the Smithsonian, and a visiting scholar in the Department of Human Evolutionary Biology at Harvard University. He has also authored four books. Called a "daring eco-adventurer" by Margaret Atwood, his writing has appeared in The Best American Science and Nature Writing and he has been a regular guest on The Colbert Report, Conan, NPR's Fresh Air, and CBS Sunday Morning.